Fishermen’s Village features 33 shops and boutiques, seven restaurants, live entertainment and special events. 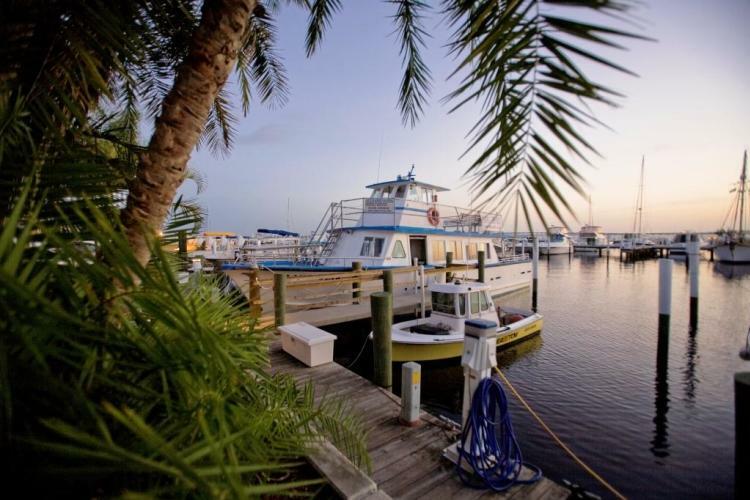 Situated along beautiful Charlotte Harbor, architecturally rich Punta Gorda is a "True Florida" boating town offering a genuine old Florida atmosphere with new amenities. Cobbled streets are lined with huge royal palms, restored period homes, vintage streetlights, boutiques and art galleries – an engaging setting for a state-of-the-art event and conference center. Amenities and nearly everything to see and do, from spas and eclectic shopping to nature parks, and fine dining at trendy restaurants and sidewalk bistros, are located near the historic downtown waterfront. Punta Gorda’s waterfront location and numerous parks welcome visitors and nature enthusiasts to walk, jog, or bike along paths for possible encounters with birds of almost every feather, turtles and other local wildlife. In addition to winding trails and pathways, Laishley Park on the Peace River and Gilchrist Park on the harbor offer boating and fishing access, as well as gardens, picnicking, and tours and cruises. Several area environmental and wildlife centers, like Babcock Wilderness Adventures, provide guided eco tours and educational programs throughout the area. As Florida’s second-largest open-water estuary, the harbor feeds peaceful coves and bays and 200 miles of Blueway Trails ideal for paddling enthusiasts. The marina at Punta Gorda’s Fishermen’s Village provides the perfect spot to shop and dine, as well as charter a fishing boat or board a tour boat for an island hop, luncheon or sunset harbor cruise. Charlotte Harbor & the Gulf Islands was recently ranked by Golf Digest as the 3rd Best Place in America to Live and Play Golf, and has plenty to offer the golf enthusiast, including 4½-star ranked courses. Art galleries, festivals and exhibits; a professional symphony orchestra and theatrical productions offer artistic and cultural experiences year round in Punta Gorda. History buffs can soak up Charlotte Harbor & the Gulf Islands’ rich past in the town’s varied museums, including the Museum of African-American History & Culture and the only military/aviation museum on the Gulf Coast. Ten outdoor murals depicting the area’s social and natural history and trolley tours round out the historical offerings in Punta Gorda.